SUCRE – Bolivian President Evo Morales and Peru’s Pedro Pablo Kuczynski agreed here Friday on a program that promises to give landlocked Bolivia access to the Pacific Ocean. One major element of the plan calls for including Bolivia on the route of a railway linking Brazil’s Atlantic ports with the terminals on the Peruvian stretch of the Pacific coast. At the same time, Lima will implement a long-dormant pact to accommodate a permanent Bolivian presence at the Peruvian port of Ilo. The projects were discussed at a binational Cabinet meeting here in Bolivia’s constitutional capital. Kuczynski joined Morales in defending La Paz’s proposal for a railroad linking Ilo with the Brazilian port of Santos via Bolivian territory, as opposed to a more costly and environmentally risky initiative that would bypass Bolivia in favor of a direct link between Brazil and Peru. He has always insisted that the project will benefit not only Bolivia, Brazil, and Peru, but also Paraguay, Argentina, and Uruguay, thanks to a project link between the railroad and the Paraguay-Parana inland waterway. In the final declaration from the meeting in Sucre, the two presidents call for “the prompt implementation” of a 1992 convention intended to give Bolivia access to Ilo. Bolivia is locked in an acrimonious legal and diplomatic battle with Chile over La Paz’s quest to reclaim a part of the Pacific coastline lost to the Chileans in a 19th-century war. Currently dependent on using ports in northern Chile, Bolivia is anxious to secure another outlet to the sea. 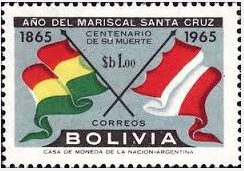 It is undeniable that Peru and Bolivia have common roots. After living a year in Lima, I can say that we are very much alike and should have kept together, as Marshall Andres de Santa Cruz intended, Chile and other countries were afraid and forced us to split. Regardless of governments, the citizens of both countries have always managed to be together. I just welcome this Peruvian intention to help us!